Smith, F. (1874) Descriptions of new species of Tenthredinidae, Ichneumonidae, Chrysididae, Formicidae, &c. of Japan. Transactions of the Entomological Society of London (4) 7: 373-409. Total length of workers around 3.5 - 8 mm. Body color dark reddish brown; head and gaster blackish brown. Scapes, mesosoma and legs relatively long. Pronotum varying from feebly punctate with weak luster to distinctly punctate and opaque. Rugae are sometimes developed on the lateral pronotal surfaces of larger workers. Pronotal humeri not angulate. Mesonotum covered with rugae, and with its dorsum raised to a variable degree. Propodeal spines broad basally and acute apically, their dorsal outlines straight and ventral outlines concave in lateral view. 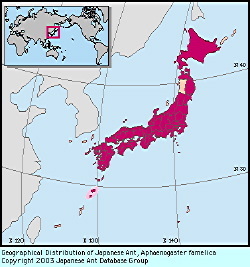 This is the most common Japanese Aphaenogaster species. It is found in lowland areas of eastern Japan, and ranges from lowlands to mountainous areas in the west. Nests are found in open soil or under stones in woodlands and their margins. Gastral turn-dpwn is apparently absent in foraging workers. Chromosome number 2n = 34 (from Tanzawa, Kanagawa Prefecture: Imai, 1969). Aphaenogaster erabu, which inhabits Kuchinoerabu-jima and the Tokara Islands, is distinguished from the A. famelica by its yellowish brown body color and elongate propodeal spines, and by the downwards turning of the gasters in foraging workers. Hokkaido, Honshu, Sado I., Izu Is, Shikoku, Kyushu, Iki I., Tsushima I., Tanegashima I., Yaku I.; Mainland China.